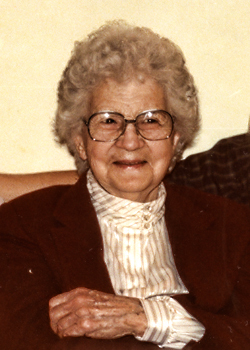 Thursday of this past week would have been her 116th birthday. A long life, for sure… yet one that seems all too short for those of us who loved her. We — her children, her grandchildren, and so many other descendants — pause to remember her this week. And — as we so often do — we will let her speak for herself. As I pass my 76th birthday, I find myself wanting our grandchildren to know something of the era in which their Grandfather, Clay, and I grew up. In retrospect we often remember the pleasant, but it was not always lovely & pleasant. Thank goodness they won’t be dosed with calamine and castor oil. They won’t have to wear long underwear from Oct. to May – or wear long black stockings and high button shoes, read by oil lamps – (maybe!? ), walk two miles to school, pick up corn-cobs for kindling, or wear a flannel cloth soaked with coal oil and lard on their chest until it blisters. I am sorry, however, that they will never know the excitement of hog killing time, and the magic words “The thresher is coming,” taste delectable cold clabber with sugar sprinkled on top, feel the cleanliness of home-made lye soap, and they probably will never have the pleasure of opening a school lunch bucket and finding a slice of country ham fried in an iron skillet, buried between two soft buttermilk biscuits. Or two pickled eggs pickled in beet juice, or eat a big piece of hot homemade bread, spread with freshly churned butter. Too, they’ll never know the sweetness of homemade blackberry jam spooned from a crock jar. Or the excitement of finding a new hens nest in the lay in the barn loft. They will miss the snugness and secure feeling of sleeping in a cold upstairs room with a nightcap on their head and a hot wrapped brick at their feet. Not yet, Mama Clay. Not quite yet. I’m not missing those pickled eggs – can’t even stand to look at them in a jar. But I love your grandmother’s special letter and the insight into her world. That’s a wonderful gift. Don’t tell anybody… but pickled eggs??? Ewwwwwwwww. What a wonderful letter! I absolutely love it. Thanks for sharing. Thanks! We’re lucky to have it.